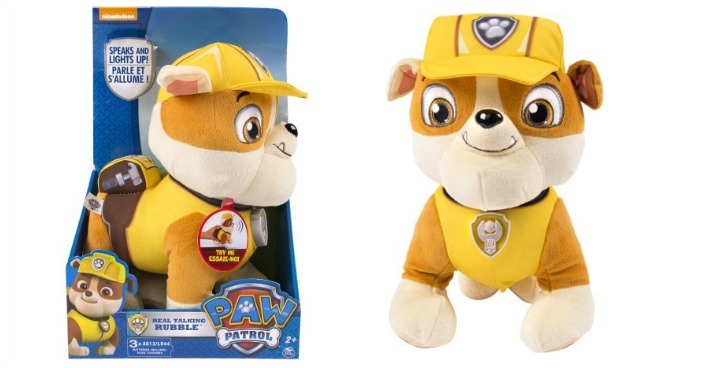 Paw Patrol Real Talking Rubble Just $13.14! Down From $25! You are here: Home / Great Deals / Paw Patrol Real Talking Rubble Just $13.14! Down From $25! Right now you can get this Paw Patrol Real Talking Rubble for just $13.14 (Reg. $25) at Walmart! The Paw Patrol Plush from Nickelodeon brings the hit children’s show to life, right in your home. This toy is based on the popular character, Rubble, and speaks some of his most famous lines when you squeeze his belly. This real talking plush also lights up as he speaks for extra fun and excitement. Rubble comes with a sewn-on pack with pictures of equipment to help children imagine exciting adventures. He wears an authentic Paw Patrol safety helmet, which is removable for when your kids want to take Rubble to bed at night. This toy is made from soft plush materials, so he’s fun to hug and hold. Let your kids take him along with them as they go to exciting places and have him on hand for soothing and security. This Paw Patrol plush is a fine gift for your favorite little fan. Collect all of Rubble’s friends for extra fun (each sold separately).